Throughout his almost four decades of life on the road, Charles Kuralt has introduced us to people and places that have warmed our hearts. Now in Charles Kuralt's Spring, he disposes with winter's chill by recounting some of the most miraculous rites of spring he has witnessed over the years. Combining ageless pieces from his years at CBS News with never-before-recorded material, Kuralt takes us on an unforgettable journey. From a garden blossoming along a Virginia roadside and the sap rising in the maple trees of Vermont to butterflies awakening and migrating along the California coast and jazz musicians chasing the winter blues away, Kuralt captures the beauty of spring in all its glory. 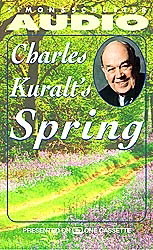 A listening treasure from one of our most beloved chroniclers, Charles Kuralt's Spring will brighten our hearts as spring brightens our days.